Discussion in 'The Beautiful Game' started by Excape Goat, Aug 30, 2005. Florin Prunea (Romania): Was usually backup to Bogdan Stelea in the national team, but actually got to start in several games in 1994 after a disasterous performance by Stelea vs. Switzerland. Prunea didn't play in any big leagues, but is the best option for this team. Garba Lawal (Nigeria): The man with a palindrome for a surname won 3 medals with his national team, plus played a part of the memorable Nigerian 98 WC side. He could play anywhere on the left flank, so think of him as an additional attacking option here. Mostly played in Eredivisie, with the team Roda. Christian Kabasele (Belgium): I think it's safe to say that he has taken an unconventional route towards Premier League, at least for a Western European. While he began in Belgium, he moved to Bulgaria in 2011, where he stayed for just one season, before returning to Belgium. Plays for Watford nowadays, and looks to be one of the defenders that will take over in the NT after Kompany/Vertonghen, etc. retire. Cosmin Moți (Romania): A bit of a cult figure after his performance in the Champions League qualifying game against Zagreb in 2014. Why? Well, after his Bulgarian club Ludogorets' keeper got sent off, Moți took over as the keeper and managed to both score and save in the penalty shoot-out. Doesn't hurt to have 4 keepers in this squad, does it? Radoslav Zabavník (Slovakia): Made it to Team Czech Republic as well. Can play centrally, if Buljat is not up for it. Zabavník had a few decent seasons at Mainz in Bundesliga, and participated in the 2010 WC. Jordi Gómez (Spain): The central midfielder didn't quite make the grade at the famous La Masia, but managed to get a sufficient amount of Premier League experience, playing for teams like Wigan & Sunderland. Primary role here will be ball retention and defensive responsibilities. Plays in Levski Sofia right now. Vladislav Radimov (Russia): The playmaker won the domestic league with CSKA, and the UEFA Cup with Zenit. He is extremely important for the team, as he is capable of making the midfield function as it's supposed to. Hamed Namouchi (Tunisia): French-born Tunisian midfielder who'll have a more attacking role than Radimov. Was a big McLeish favourite at Rangers in the mid-2000s. Gabriel Obertan (France): Was and is teammate with Gómez in both England & now in Bulgaria. Is usually associated with the failed stint at Man Utd, but I feel that his peak in Bordeaux showcases what he should be capable of in these theoretical lineups. He is a creative winger who will occupy the right side. Currently in Bulgaria. Bernardo Redín (Colombia): Successfully partnered up with Valderrama at Deportivo Cali in the 1980s. Obviously not as skilled as him, but ending up on the scoresheet twice at the 1990 WC is not a bad career highlight. Mário Jardel (Brazil): With Jardel on the field, who needs a second striker upfront? Well, at least if you ignore his post-30 career, because THAT Jardel was one of the most clinical forwards on the planet. Ukraine has the potential of being the best team out of the ones I've assembled so far. The question is if players from teams other than Shakhtar Donetsk/Dynamo Kiev will make the cut? Stipe Pletikosa (Croatia): Was the starting keeper for most of his NT career, with over 100 caps to his name. His club career was mostly spent in Croatia & Russia, but also had a not-so-good time at Shakhtar & Tottenham. Benoît Trémoulinas (France): Won Ligue 1 with Bordeaux, and Europa League twice with Sevilla as a starter (until his injury before the 2nd final). Maybe not the most famous name, and some might've gone with Raț, Strinić or Taiwo instead, but in his prime, he was a good modern fullback with good crossing ability. Kakhaber Kaladze (Georgia): A somewhat forgotten/overlooked player outside of his home country (easily happened when you're on the same team as giants like Nesta & Maldini). However, in Team Ukraine, he is without a doubt the leader of the defence, whose defensive prowess will be key to success. Domagoj Vida (Croatia): Maybe it's the WC hype playing its part, but honestly, there is no one clear CB candidate to partner up with Kaladze. Vida did an excellent job as the Balkans won the silver medal in Russia. Fernandinho (Brazil): Another former Shakhtar player, one who doesn't need any introduction for those who follow the Premier League. The defensive midfielder arrived in England relatively late in his career, and became a starter immediately. Has won the PL twice, as well as the UEFA Cup once. Yaya Touré (Ivory Coast): Jumped around from club to club (and league to league actually) before he finally settled down at Man City. At his peak, he was one of the best box-to-box players on the planet. While his attitude might leave a lot to desire, his physical & technical abilities are world class. Willian (Brazil): Damn, Ukraine has had lots of great players in the past, haven't they? Might as well enjoy it, before returning to creating squads for countries like Moldova & Belarus. Sigh...Anyway, Willian is an attacking midfielder who creates a powerful duo with Srna on the right side. Douglas Costa (Brazil): Winger who can play on both sides, and I will go with the left one even though I think he prefers the right one. His dribbling is outstanding, but don't expect tons of goals from him! Henrikh Mkhitaryan (Armenia): I'll use him as a second striker in front of Fernandinho & Touré, and in between the Brazilian wingers. His time in Man Utd was unsuccessful with the exception of a good Europa League run. In Dortmund, however, he showed how good he can be. Cristiano Lucarelli (Italy): Yes, I know, this looks more and more like a "best players to play in Shakhtar" rather than the whole league. With no forward candidate that really stands out from the rest, I think Lucarelli's goal ratio in minor Serie A teams is impressive. And with the services provided from all parts of the field, you can bet that he will find the net quite frequently. Mart Poom (Estonia): One of the greatest Estonian players of all time. The keeper has lots of PL experience, especially with Derby County. Taye Taiwo (Nigeria): The left-back didn't have a successful time at Milan, but before that, he was a regular starter for the Ligue 1 top club Marseille. Has two tournament medals for his national team. Abdoulaye Méïté (Ivory Coast): Another West African defender with lots of OM appearances. Played 48 games for his country. Darren Purse (England): The weakest link in the defence? Still, much better centre-back than most alternatives due to his many Premier League games. Christian Gyan (Ghana): The highlight of his career came when he started in the 2002 UEFA Cup final, when his team Feyenoord beat Dortmund. He was the right-back that day, so that's the position he'll be given here as well. Anthony Annan (Ghana): Defensive midfielder who is actually playing in Finland right now. Didn't turn out as good as people had expected, but is relatively speaking one of the best options for this position. Like Taiwo, won 2 medals for his national team. Reuben Gabriel (Nigeria): 2nd-best central midfielder I can think of, besides Annan. Won the ACN with Nigeria in 2013, but didn't get any playing time. Julien Faubert (France): Real Madrid legend (lol) who is most comfortable on the right flank. Has a good career CV, even though the Spanish giants were obviously way out of his league. Freddy Adu (USA): It says a lot about the quality of the Finnish footballing imports when Adu makes the cut. To be fair, his trophy cabinet is filled with 3 medals at international level. Hans Gillhaus (Netherlands): While his Eredivisie goal stats weren't enough to gain more than 9 caps for the Oranje, they certainly are good enough to easily get a place in this lineup. Marlon Harewood (England): Represented God knows how many teams in both the Premier League and League Championship. His prime saw him score 14 times for West Ham in the 2005-06 season. Bench: The Croatian Lazio GK back-up Ivan Vargić was in Euro 2016. The former Real Betis keeper Toni Doblas is another option. Albania's team captain Ansi Agolli is Taiwo's substitute. The Nigerian forward Nnamdi Oduamadi, who scored a hattrick at the Confederations Cup, surprisingly still belongs to Milan. Let's move eastward by looking at Team Poland. Ján Mucha (Slovakia): Did not have a particularly great club career, but was the main keeper for his country during his prime. Anatoliy Demyanenko (Soviet Union): A left-sided Ukrainian fullback who won numerous domestic titles, and was voted the POTY in 1985. An indisputable starter here. Marcelo (Brazil): No, not the Real Madrid one! It's the centre-back who currently plays for Lyon. Played for PSV Eindhoven, Hannover & Beşiktaş before becoming a regular for the Ligue 1 top club. Ulrich Borowka (Germany): Started out his career with Borussia Mönchengladbach, but it was with Werder Bremen that he his biggest success. Won the Bundesliga twice with them. His NT career was less impressive, with only 6 apps in total. Kew Jaliens (Netherlands): Don't think right-back was his primary position, but lack of alternatives, plus the fact that he played there vs. Argentina at the 2006 WC, gets him the RB spot here. Winning the Eredivisie with AZ Alkmaar was a career highlight. Paulinho (Brazil): The guy with probably one of the strangest career trajectories ever. While he flopped at Tottenham, him delivering for the Brazil NT as well as Barcelona makes Paulinho the biggest star in this team, where he gets the defensive midfielder/box-to-box role. Amaral (Brazil): Very Abreu-like in terms of never staying too long at a club. Despite this, the holding midfielder won 15 trophies over the course of his career. A silver medalist with Brazil at the 1996 Gold Cup. Olivier Kapo (France): Left winger who was good under Guy Roux at Auxerre, but never really made an impact at neither Juventus nor the Premier League. Won the Confederations Cup with France in 2003, where he got playing time in all but one game. Miloš Krasić (Serbia): On the opposite flank, we have a guy who, at the turn of the decade, was compared to Pavel Nedvěd. Alas, he couldn't live up to the hype once he left CSKA, and will have to settle for a guaranteed spot here instead. Tomáš Necid (Czech Republic): Not that many prolific scorers to choose from, to be honest. Went with Necid due to his time with CSKA, and an ok goal ratio for the national team. Oleg Salenko (Russia): The player who epitomizes the term "one hit wonder" with his 5 goals versus Cameroon at the 1994 WC. To be fair, his La Liga stats prior to joining Valencia were not bad, so for his peak level, he is the main guy to rely on for goals here. While researching the Ukrainian league, I discovered that the Croatian forward Eduardo da Silva has been playing in Ekstraklasa since January this year. So what I'm going to do is relegate Necid to the bench, and remove Nikolić from the squad. With da Silva as a goalscoring threat, Team Poland immediately looks a lot stronger. This Jaime Rodríguez is the one who played at WC 1982? Yep, that's the one who started in the infamous 10-1 game against Hungary. Sounds promising for Team Finland in case he should ever come off the bench, doesn't it? Btw, a bit random that he ended up on a loan in Finland of all places back in the 80s. I read somewhere that it happened after he met a Finnish photographer in Mexico. Yeah, I think Mendoza is the only one so far. Aside from Team Romania, he was on my shortlist for Ukraine as well, but the competition is much higher so he didn't make the cut. For Team Sweden, Yoshimar Yotún made the reserves list. Too bad Juan Manuel Vargas never played in an obscure league, he is one of my favourite players of all time. Since all players were still young enough to actually play together, Kicker organized an event in which they played against a selection of Lower Saxony (they won 5-3). The actual team that was selected was not quite the same as seen on this cover. On this cover, only those players were shown that had agreed on playing the game. 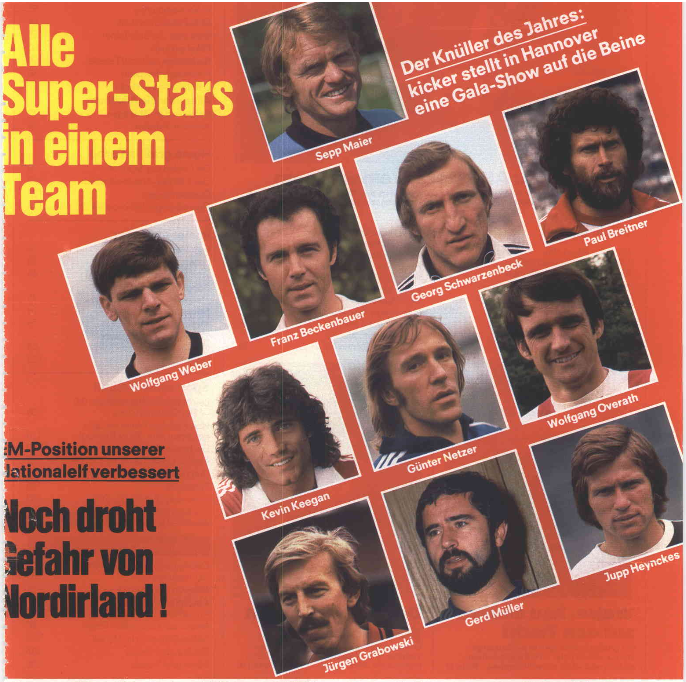 Berti Vogts, Karlheinz Förster and Karl-Heinz Rummenigge were not able to play, in their place Wolfgang Weber, Georg Schwarzenbeck and Jürgen Grabowski were playing and are thus seen on the cover. La-Máquina, Excape Goat, comme and 1 other person repped this. Time to resume my series of Europe's lesser leagues by going to Balkan. A bit difficult to research because of Yugoslavia splitting into various countries, and what constitutes as a foreginer, but I think I've found a good squad. Mladen Božović (Montenegro): First played for a Serbian club in 2008, which was two years after Montenegro's independence, so he is eligible for this list. Božović has 43 caps to his name, and has played in countries like Russia, Hungary & Greece. Taribo West (Nigeria): Part of the Nigerian team that did so well in the group stages of the WC 1998. Had a relatively succesful time in Ligue 1 & Serie A (winning 4 trophies in total). Miodrag Belodedici (Romania): Without a doubt one of the greatest Romanian footballers ever. The sweeper's highlight was winning the European Cup (precursor to Champions League) twice for two different teams. He was arguably past his prime when he played in La Liga, but altogether had a fantastic career. Stefan Savić (Montenegro): Despite winning the PL in 2012, he never really made an impact in Manchester City, and found better luck at Fiorentina and now Atlético Madrid. He may not be absolute worldclass, but he is a really good defender who will bring a lot to the table here. Branko Ilić (Slovenia): The right-back is probably the weakest link in the back four. A Slovenia international, he was selected for the WC 2010 in South Africa, but didn't get any playing time with Mišo Brečko being the first choice. At club level, his best years were in some of the lesser leagues of Europe, while failing at big ones like Spain & Russia. Eric Djemba-Djemba (Cameroon): Joined Man Utd the same summer as Cristiano Ronaldo, and to say that they both went on to have dissimilar careers would probably be the understatement of the year. Roy Keane's supposed heir only played 20 league games for the Red Devils, and subsequently played in countries such as Denmark, Qatar & Israel. Won 2 medals with Cameroon, though. Stephen Appiah (Ghana): Remember in the mid-2000s when Ghana had that magnificent midfield trio of Essien, Appiah & Muntari? Well, Appiah was the captain of that team and it's easy to see why, both for his leadership on the pitch and his footballing qualities. The box-to-box midfielder's peak was in Serie A teams, including Juventus (played 30 games for them in one season). Unfortunately, injuries hampered his career in his late-20s and he was never the same player again. Milenko Ačimovič (Slovenia): Spurs fans reading this might be bemused by this selection. However, the attacking midfielder had done a good job in Red Star Belgrade before that, as well as being part of Slovenia's golden age team around the early 2000s. In his first season in Ligue 1, he managed to come 2nd with Lille. Towards the end of his career, he did well in Austria. Valeri Bojinov (Bulgaria): Going with 3 forwards here. I'm sure we're all familiar with Bojinov's talent, and how he never quite managed to live up to the hype. His best years were spent in various Italian clubs, with Lecce being his breakthrough team. His days in PL & the Portuguese league were pretty much forgettable. For his national team, he participated in the Euro 04 at the tender age of 18. Rudolf Wetzer (Romania): I'll be the first one to admit that I don't know much about him, other than that he captained Romania in the first FIFA World Cup in 1930. Judging from his goal average for the NT (13 goals/17 games), he was pretty profilic back then. Aílton (Brazil): A quick glance at the list of clubs he has played in makes him seem like just another journeyman. Admittedly, that's what he was towards the end his career. However, he is selected to Team Serbia for his great goal ratio in Werder Bremen: 88 goals in 169 Bundesliga games and 106 goals (204 games) in total. Aílton was uncapped at international level. Gregoriak, Excape Goat and annoyedbyneedoflogin repped this. Just seconds after the editing limit is up, I discover that Marko Marin plays for Red Star Belgrade these days. He easily replaces Ačimovič as the starter, while the Slovene takes Georgiev's bench spot. Marin was billed 'the German Messi' when young, and was part of the WC 2010 squad. Sadly, he flopped at Chelsea, and have had a very up-and-down career. 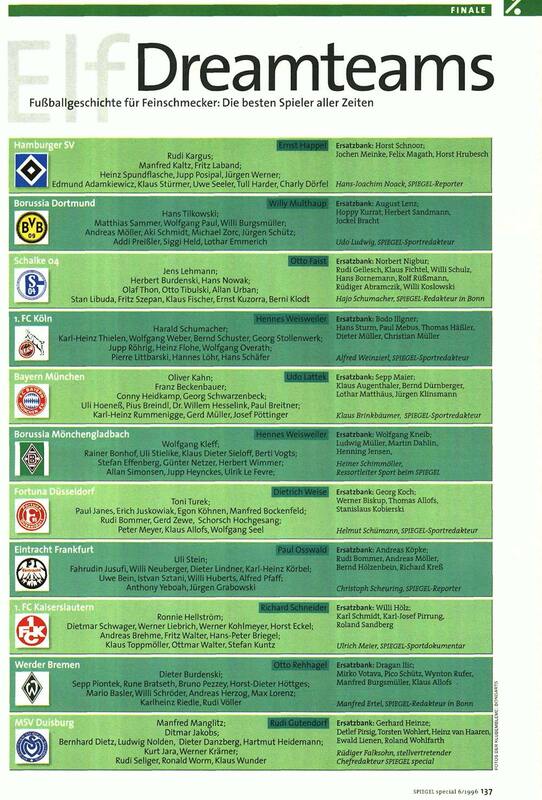 While doing a research to make an "All-time Kaiserslautern" (Starting 11 and reserves to pes2018), I found this interesting special from Spieler doing some German Dreamteams in 1996. La-Máquina, annoyedbyneedoflogin, Gregoriak and 2 others repped this. Eduardo (Portugal): Had a few good seasons in Portugal before being Genoa's #1 in the 10/11 season in Serie A. Chelsea signed him from Dinamo Zagreb in 2016 as a back-up. Was only Portugal's starter in one tournament: WC 2010. Nevertheless, he is a Euro 16 winner, which isn't too shabby for someone who hadn't played a single senior game until he was about 24. Leandro Cufré (Argentina): Probably one of the lesser known Argentina internationals, Cufré played for clubs such as Roma & Monaco. Since he appears to be capable of playing both centrally and to the left, it solves the LB problem I had with this team. Boštjan Cesar (Slovenia): Played for Dinamo Zagreb's youth team, but was born and raised in Slovenia so he counts as an expatriate footballer in Croatia. Cesar wasn't entirely a regular when playing in Ligue 1 teams Marseille & Grenoble, but has had a much better time in Serie A team Chievo, where has been playing for the past 8 years. Impressive that he's never been relegated in a club that so far has punched above their weight. 100+ caps for Slovenia. Jens Nowotny (Germany): One of those surprises that I hope people find from time to time while reading these lists. Who knew that Nowotny had played in Croatia of all places? The Bayer Leverkusen legend was instrumental in the successes that the Bundesliga club had in the early 2000s. Sadly missed the 2002 CL final due to injury. At international level, he had 2 disappointing Euro Cup tournaments, but got a bronze medal in WC 2006. Avdija Vršajević (Bosnia & Herzegovina): Made the bench for Team Czech Republic and starter for Team Slovakia. The only good RB I can think of, and actually scored one of Bosnia's first WC goals in 2014. Rodney Strasser (Sierra Leone): A defensive midfielder who makes the cut on the basis of having played over 20 Serie A games throughout his career, something that the other alternatives can't match or top. Was an AC Milan youth product. Josip Skoko (Australia): As his first name reveals, Skoko is of Croatian descent. He moved to Hajduk Split in his early 20s, before finding his biggest success in the Belgian league. The central midfielder also tried his luck in Turkey and in PL with Wigan. Was part of Australia's golden age along with players like Cahill, Bresciano, Kewell, etc. Nastja Čeh (Slovenia): Another midfielder who mainly plied his trade in Belgium. The attacking midfielder didn't make into Slovenia's Euro 2000 squad, but was included 2 years later, and altogether gained 46 caps in total. Hugo Almeida (Portugal): Along with Postiga, he has sort of become a symbol of the post-Pauleta/Nuno Gomes striker drought that has troubled Portugal in the past 10 years or so. To be fair to Almeida, he still managed 19 goals for his country, and did well in Werder Bremen & Beşiktaş. Mark Viduka (Australia): He shares many similarities with Skoko in that they are both of Croatian heritage, born in 1975, and moved to Croatia in their early 20s. The similarities sort of stops there, because Viduka was obviously much more talented and with a greater overall career. His best years were spent at Leeds in PL, but was also important for Middlesbrough, where he made the UEFA Cup final in 2006. Fredi Bobič (Germany): Was born in what is today Slovenia, but moved to Germany soon after his birth. Was incredibly profilic in Stuttgart and managed to win the Euro 96 at NT level. Played only 3 games for Dortmund in the season that they won the BL, due to moving to Bolton during the winter. annoyedbyneedoflogin and msioux75 repped this. I've made a few discoveries that I'm considering adding to the squads I have listed so far. I already retroactively added Eduardo da Silva for Poland. Also, I've replaced Bony with Braine for Czech Republic as per msioux75's suggestion. I'm a bit unsure in some cases below, especially those born before the 1970s. Finland: Leonid Buryak, Yuri Gavrilov, Gordon Hill & Ferenc Bene. Yeah, Raimond Braine was a european star in the 1930s, playing for Sparta Prague. Some players as Buryak, Gavrilov, Bene, Burns & Baptista were very good players in their prime. Did they played regularly in those countries to be included? I have done an all-time teams for French Algerian, Australian-Croat, Surinamese-Dutch, Indonesian-Dutch, German Turks, Polish disapora, Chinese diaspora, etc. Some sounded so difficult, but they were not so difficult. At the time pf writing, I am toying with doing an all-time team for etthnic French national team. Bascially, I have to take away Platini, Kopa, Amoros, Thuram, Zidane, Henry, Cantona, Fontaine, etc. That's the easy part. The difficult part is adding ethnic French onto the team. I do not knw how to start. I finished a new blog entry. What if Germany sent this team to the WC Finals in 2002? Basically, in a "German" perfect world, Scholl and Deisler were injured free. Effenberg returned to the national team. Robert Prosinecki, Robert Kovac Yıldıray Baştürk and Ümit Davala chose to play for Germany (I ruled out Owen Hargreaves who was eligible in 2002). This lineup is actually pretty bad. In the actual World Cup Finals, Germany were a seeded team and finished first in their Group. An improved German team would not have helped them much. They would have played the same team in the knockoff stage. This imaginary German national team won't be changing anything until the Final. Brazil with Ronaldo, Rivaldo, Ronaldinho and Roberto Carlos might still be too strong for them. Furthermore, Ballack, Scholl, Effenberg, Prosinecki and Baştürk played in the same position. They could not play together. Thanks for your reply. To be included, all you have to do is to play a minimum of one game for a club in that country. These lineups focuses more on their overall careers and footballing CV rather than what they actually performed for that particular club. Alex Cordaz (Italy): There is always a limited amount of goalies in this type of lists. Cordaz is by far the best choice for the small country east of Italy. He started out as an Inter Milan youth, and went out on several loans. Has been Crotone's starter since 2015, and got to play in Serie A for two seasons. Danijel Pranjić (Croatia): Was born when Slovenia & Croatia were part of the same country. The attacking left-back is one of the most merited players on the team. His breakthrough came for Dutch team Heerenveen, which was rewarded with a less successful stint at Bayern Munchen. Got 58 caps for Croatia. Geri Çipi (Albania): Played for Belgian club Gent in the early-2000s. Not much to say here, other than that he got 34 caps for Albania in total. Eric Akoto (Togo): Similar to his CB partner, had a few years at a medium-sized club (Austria Wien) but otherwise an unremarkable club career. Was part of Togo's 2006 WC squad, but got no playing time. Still, 56 appearances for his country is not bad. Mitch Apau (Netherlands): Honestly the only right-back that I could find for this team. Played for a few Dutch & Belgian teams, after which he decided to play in the two "Slo" countries (Slovenia & Slovakia respectively). While in Westerlo, at the age of almost 25, was appearantly rumoured to Chelsea. Nabil Taïder (Tunisia): The French-born Tunisian defensive midfielder played over 100 games for Toulouse, the team he started out with. For some reason, his career waned by the time he was 25. Robert Prosinečki (Croatia): I think it goes without saying that Prosinečki was one of the greatest players of his generation. His mere presence will raise Team Slovenia's standards significantly. Played for both Real Madrid & Barcelona, but his prime was probably Red Star Belgrade, where he won the European Cup (CL) in 1991. Albert Riera (Spain): When you think back to the extraordinary Spanish generation from 2008-2012, I bet Riera is not the first one on your mind. While he didn't win either the Euros or WC, he did gain a whole 16 caps, and was part of the 2009 Confed Cup squad. The left-winger played for many good clubs, like Bordeaux, Espanyol, Liverpool & Galatasaray. Stephen Makinwa (Nigeria): The forward spent the majority of his career in Italy. Was not a great goalscorer at all, so I'm going to assume that his best attributes will shine through if the main responsibility of finding the net will go to the two players below. Gianluca Lapadula (Italy): A late-bloomer who started as a Juventus youth. Played in lower divisions for several years, until his big break came in the 15/16 Serie B season for Pescara. Was subsequently sold to Milan, where he scored 8 league goals in total. Nowadays with Genoa. Versatile, can play in a more supporting role as well. Tomo Šokota (Croatia): It is safe to say that injuries could have been much better without all those injuries. After managing a good goal ratio for Dinamo Zagreb, he went to Benfica, where he scored 21 league goals in 60 games. Interestingly, 3 of his 8 caps for Croatia came at the Euro 2004 tournament in Greece. msioux75 and annoyedbyneedoflogin repped this. Some years ago, Lapadula was asked to being naturalised in order to play for Peru NT as a Paolo Guerrero's backup, due to his peruvian mother. At that time, Peru was far from a WC spot and Lapadula was sold to Milan, so he prefered remained italian, gaining his first caps with the azurri. I had no idea he was half-Peruvian. He would have been a good asset to your NT once Guerrero & Farfán retire. If I remember correctly, there was another player who had the chance to play for Peru, someone from the Swiss league I think. We move on to one of the smallest countries in Europe. Thus, putting together a decent team might prove a tough challenge. Tony Warner (Trinidad & Tobago): One of those journymen players whom you think to yourself "which clubs did he NOT represent?" rather than which ones he did. He appears to have been mostly a backup goalie, except for his successful time at Millwall. Was born and raised in England, but has T&T ancestry, so got 2 caps with them. Landry Mulemo (DR Congo): Similar to Warner, Mulemo was actually Belgian but chose to represent DR Congo. The left-back started out his career in Standard Liege, but failed to launch the same kind of career path as many of his teammates in the Belgian Olympics squad 2008. Augustine Eguavoen (Nigeria): Another player who had his best years in Belgium. He played 77 league games for Gent, and scored a relatively high amount of goals for a defender (10). 49 caps for Nigeria in total. Cristiano Bergodi (Italy): He played well over 100 games for Lazio in the 90s. While he was never capped at NT level (who can blame him with the fierce competition at the time? ), he played long enough at a really high level to be an easy pick for this XI. Cristian Zaccardo (Italy): Mostly known for to being part of Lippi's WC-winning squad in 2006. He started the first two group games, and was a sub in the quarter-final. Infamously "scored" the only goal Italy let in until Zidane's penalty in the final. His career peak was at Palermo, but was actually also a Bundesliga winner with Wolfsburg. Currently plays in Malta. Rudolf Krčil (Czechoslovakia): Unless you are really into historical lineups, you've probably never heard of him. He played all 4 games for silver medalist Czechoslovakia at the 1934 World Cup. A bit random that he ended up in a Maltese club during this era, but it's a nice addition to an otherwise difficult position to fill. Christian Callejas (Uruguay): During the late-90s and early-00s, he participated in 2 Copa Americas & 1 Confederations Cup for Uruguay. He was primarily a squad player there, while at club level, he excelled at Danubio. Never quite made it in Europe, though. Jordi Cruijff (Netherlands): It's definitely a heavy name to carry as the son of an all-time great. While someone like Christian Maldini is far away from making the cut in Team Malta, Jordi's own career was not bad if you ignore the surname. Played over 50 games for both Barcelona & Man Utd. Part of the Dutch Euro 1996 squad. Yannick Bolasie (DR Congo): Born in France, but started his professional career in England at a lower level. Then took an unusual route to Malta by signing for Floriana. He soon returned to England, where he worked his way up to become a Premier League regular in Crystal Palace & Everton. Left-winger. Fabrizio Miccoli (Italy): Never a world-class, but he was a quality second-striker who had his best years at Palermo. Great penalty taker, and if you're hoping for someone to assist you for a goal, Miccoli is your guy. Paul Mariner (England): Scored lots of goals for Plymouth & Ipswich in the 70s & 80s. Was one of the goalscorers for England at the 1982 FIFA World Cup. Has become a bit forgotten over time, but seems to have been pretty good back in the day. Please, do you remember for which club Waddle played at this time?